Count Your Money and Detect Counterfeits in Seconds! 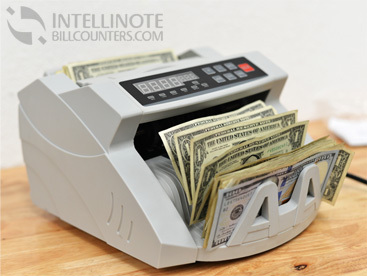 With the Intellinote Bill Counter you'll save time, significantly cut down on human error and efficiently block fake banknotes from affecting your business's bottom line. With this compact, lightweight portable unit you can reduce the time intensive task of hand counting while simultaneously protecting your business from fraud. Every year small businesses lose money due to counterfeit banknotes. With the increasing advanced individual printing capabilities, counterfeit currency is getting sharper and harder to detect by the naked eye. Intellinote Bill Counter uses ultraviolet and magnetic sensors to catch these fakes so you won't have to!